Owners and operators of hotels, restaurants, coffee shops, industrial kitchens, catering companies of shapes and sizes need their tools to be in pristine condition to deliver dishes to their customers. At Bladerunner we understand that and so we use the "Tru-Hone" machinery made in US. It is encased in stainless steel and complies with CE. 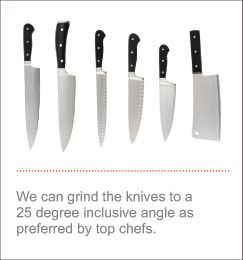 We can grind the knives to a 25 degree inclusive angle as preferred by top chefs.